When it comes to finding Columbia’s hidden gems, nothing beats a local guide - and that’s where we come in. We’re here to take you on a journey in and around the Main Street District. We’ll share our favorite Soda City hotspots, the city’s best festivals, and not-to-be-missed attractions. Check back regularly for all the inside scoop on everything we love around here. Who doesn’t enjoy a good glass of vino and mouth-watering bites? For the 2019 year, Free Times and the Five Point Foundation will support this delicious 3-day event. Who doesn’t enjoy a good glass of vino and mouth-watering bites? For the 2019 year, Free Times and the Five Point Foundation will support this delicious 3-day event. Each day will support a different event, including a five-course meal kick-off, expanded Soda City Market, brunch, wine-making seminars and the finale Food and Wine Festival. 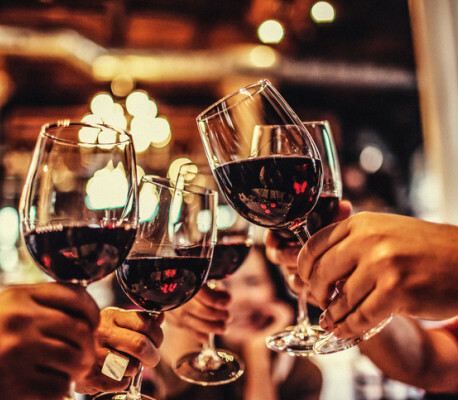 The concluding fest will feature wines and other alcoholic drinks, foods from over 50 local restaurants, a farmers market, and live entertainment. If you’re not careful, you’ll be just as “full-bodied” as a glass of Merlot by the end of the festivities. The beauty of this weekend adventure is your ability to customize your experience. Buy tickets to just Sunday’s festival, or for real fans, buy tickets to every one of the seven distinct events throughout the weekend. For full details and to purchase your tickets, click here to explore the event website. Next Friday night, the Colonial Life Arena is welcoming over 10 artists to the stage to jam out with us. 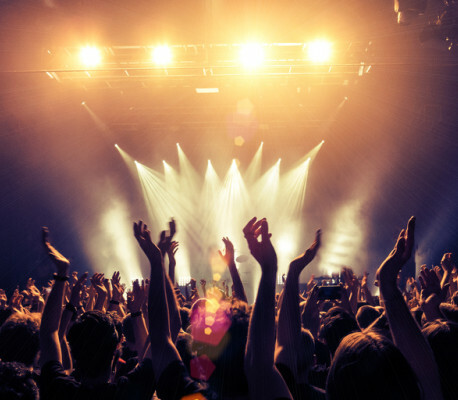 Next Friday night, the Colonial Life Arena is welcoming over 10 artists to the stage to jam out with us. Guests can anticipate performances by Danny Gokey, Mandisa, Hollyn and much more. There will also be a pre-jam party featuring artists such as Manic Drive and Adam Agee. Located just a mile from our establishment, it’s the perfect way to conclude a Friday night. Doors open at 6:00 p.m. Tickets are available at the official site, where you can get a full list of performers and details on parking. Looking for somewhere to unwind before the concert? We love grabbing a glass of wine at the Lula Drake Wine Parlour or a craft beer in the special ambiance of Vino Garage. We can’t wait! This Valentine’s Day, Columbia has much to offer visiting lovebirds. Get a local history lesson and gaze at the stars at Amore Under The Stars at The South Carolina State Museum. This Valentine’s Day, Columbia has much to offer visiting lovebirds. Get a local history lesson and gaze at the stars at Amore Under The Stars at The South Carolina State Museum. A champagne bar and live DJ top off the romantic event. Or, if local arts are more your style, check out Valentine’s on Main this year. Each Valentine’s Day, the main street comes alive with good cooking, live jazz music, and drinks. Is it just us, or can you already feel the love brewing in the air?! Tickets are available for couples and solo players, which include an appetizer, entrees, dessert, and drinks. Whatever you do this Valentine’s Day, it’s sure to be a lovely time when you’re staying with us. If you’re still in town for the weekend, be sure to check out the World Beer Festival of Columbia on Saturday, February 16th. 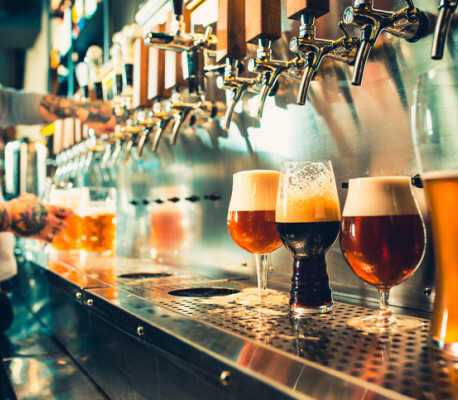 As the name suggests, patrons will get the chance to sample international, domestic and local brews. A must-see for any beer fanatic! Weekends in Columbia are always a treat. Every Saturday from 9 A.M. to 1 P.M. visitors and residents meet up on Main Street for the weekly Soda City Market. Weekends in Columbia are always a treat. Every Saturday from 9 A.M. to 1 P.M. visitors and residents meet up on Main Street for the weekly Soda City Market. Their motto, “Brain. Body. Belly.” is certainly one they live up! At this farmer’s market, visitors have the opportunity to explore South Carolinian art, find locally-sourced produce, and fill up on some delectable Southern fare. Best of all, it’s just a few blocks from our hotel, giving you the perfect excuse to take a Saturday morning stroll! Check out their site here for details. Keep the weekend rolling at River Rat Brewery’s Sunday Funday event, recurring every week on—you guessed it—Sundays! Featuring brews, a specialty menu and games galore, their patio is the place to be for a Sunday. The fun starts at 11:00 A.M. going ‘til 6:00 P.M. I don’t know about you, but we’re ready for the weekend to start now! New Year’s Eve, perhaps the biggest day for partying all year, is an over-the-top celebration in Columbia with the annual Famously Hot New Year. New Year’s Eve, perhaps the biggest day for partying all year, is an over-the-top celebration in Columbia with the annual Famously Hot New Year. Not only is it the biggest free New Year event in the state, but offers the biggest NYE fireworks display as well! The bustling event features food trucks, brews & bubblies, and groovy performances. The headliner for the big day is none other than iconic ‘90s vocal group, En Vogue, with support from jazz and brass group Soda City Brass Band and Charleston’s Little Stranger. Stick around for the midnight countdown and fireworks before enjoying a leisurely walk back to the hotel, located just half a mile from all the action. Looking for a family-friendly activity during the day? Stop by EdVenture Children’s Museum, The South’s largest children’s museum. One last adventure for the whole family before saying hello to 2019! The must-see light show, featuring over a million twinkling light displays, is a facet of the local holiday experience. Every year starting in mid-November, Riverbanks Zoo & Garden hosts Columbia’s longest-running tradition, Lights Before Christmas. The must-see light show, featuring over a million twinkling light displays, is a facet of the local holiday experience. For the small fee, guests have access to the countless displays of lights and animations, not to mention a prime setting for a holiday photo op! Perfect for couples and families, there’s entertainment for everyone. Grab a smores or hot chocolate and warm up by the Jingle Bell Bonfire or have a visit with Santa Claus. A multitude of vendors will also be on-site selling all the holiday goodies your heart desires. Located just a short drive from our hotel, it’s the perfect destination for a nighttime stroll. This month, our guests have a myriad selection of nearby events available for their consideration, so we’ve listed a couple of our favorites here. This month, our guests have a myriad selection of nearby events available for their consideration, so we’ve listed a couple of our favorites here. First, don your snazziest cocktail attire and come out to support Pawmetto Lifeline at the 12th Annual Fur Ball Moonlight Gala and Auction. Held on October 20 at the Columbia Metropolitan Convention Center, this annual fundraiser hosts hundreds of the state’s most passionate animal lovers. The evening will kick off with a cocktail reception and will include dinner, raffles, live and silent auctions, and more. Next, take a magical trip to the Land of Oz with a visit to the South Carolina State Museum. You’ll be enchanted by their transformation into the Museum of Oz, with enormous witch legs sticking out from under the building and loads of exciting Oz-related events and activities, including “Overnight in Oz.” Get ready for an incredible 4-D adventure where you are transported by a tornado to Oz. Join the Tin Man, the Scarecrow, the Cowardly Lion, Dorothy, and the Wicked Witch of the West on the Yellow Brick Road as you make your way to the Emerald City. The Museum of Oz is ongoing through November 4. Founded over 50 years ago, the South Carolina Philharmonic has grown to become one of the Southeast’s finest performing arts ensembles. Founded over 50 years ago, the South Carolina Philharmonic has grown to become one of the Southeast’s finest performing arts ensembles. Morihiko Nakahara, the SCP’s conductor, travels regularly across the country for appearances with leading orchestras, master classes, and lectures. His dedication to brining classical music to a wider audience has carried over into the SCP’s larger educational efforts and their commitment to both traditional and contemporary repertoire. On Sunday, September 29, the SCP opens its season with Dazzling Debussy, a program that pairs the French composer’s enchanting La Mer with works by Samuel Barber, George Gershwin, and Gabriela Lena Frank. On Sunday, October 28, you’ll want to bring the whole family to Halloween at Hogwarts, a celebration of the music from the beloved Harry Potter films, plus a few hair-raising works by Bach and Saint-Saëns. And on Saturday, November 10, 20th Century Classics will feature a cosmopolitan collection of pieces by American Charles Ives, Englishman Edward Elgar, and Russian Dmitri Shostakovich. Born in Charleston, South Carolina, in 1781, Robert Mills is most famous for designing the iconic Washington Monument. Slightly less famous than the Washington Monument, but no less regal (in our opinion), is the Robert Mills House, designed by Mills and constructed right here in Columbia in 1823. Born in Charleston, South Carolina, in 1781, Robert Mills is most famous for designing the iconic Washington Monument. Slightly less famous than the Washington Monument, but no less regal (in our opinion), is the Robert Mills House, designed by Mills and constructed right here in Columbia in 1823. For more than five decades, the house has served as a museum, showcasing not only the exquisite and idiosyncratic architectural design pioneered by Mills (much of which gives the illusion of greater space and grandeur), but also a range of fascinating 19th-century decorative arts, mingling styles from the United States, Britain, and France. The house and its grounds, known together as the Robert Mills House and Gardens, occupy a full city block in the center of Columbia. Tours of the house are conducted Tuesdays through Saturdays at 10 A.M. and 1 P.M. and on Sundays at 1 and 4 P.M.
As the capital city of South Carolina, Columbia is home to many culturally and architecturally significant historical sites. 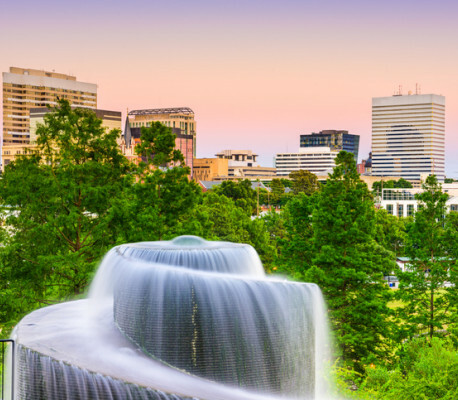 As the capital city of South Carolina, Columbia is home to many culturally and architecturally significant historical sites. Located just a half-mile from our hotel, the South Carolina State House is a stunning example of the Greek Revival style characteristic of the grand edifices of 19th-century America. The building itself was constructed primarily from blue granite (i.e., the official state stone) and marble. The building’s entrance is flanked by an imposing line of Corinthian columns, and the roof is adorned with an elaborate copper dome. On the west and southwest sides of the building, six bronze stars mark the spots where cannonballs, launched by Union forces, struck the State House during the Civil War. Inside you’ll find the offices of the governor and lieutenant governor, as well as the chambers of the South Carolina State Senate and House of Representatives. Visitors are welcome to attend guided or self-guided tours Monday through Friday year round. If you’re a lover of art or art history staying with us at Hotel Trundle, we highly recommend a visit to the Columbia Museum of Art, located less than two-minutes walking distance from our hotel. If you’re a lover of art or art history staying with us at Hotel Trundle, we highly recommend a visit to the Columbia Museum of Art, located less than two minutes walking distance from our hotel. The museum contains over two dozen galleries with pieces representing five millennia of human creativity. The permanent collections fall into the broad categories of American, Asian, European, and Modern/Contemporary, with the Kress Collection earning the museum recognition as a national center for the appreciation of the Old European Masters. Aesthetic marvels are not limited to the art adorning the walls, however. The building itself is an architectural treasure, its façade merging contemporary sensibility with neo-classical flourishes reminiscent of the museum’s former Taylor House location. Special exhibits currently on display include Jane Peterson: At Home and Abroad, a retrospective of the famed impressionist, now through July 22, and in August the museum will welcome two new exhibits, Something’s Happening: The Big Art of Katie Pell and Hiroshi Sugimoto: Time Exposed. Need plans for a Thursday night? We've got you covered. Head to First Thursday on the first Thursday of each month and experience the local art, culture, music, and the community that makes Columbia a welcome melting pot. Need plans for a Thursday night? We've got you covered. Head to First Thursday on the first Thursday of each month and experience the local art, culture, music, and the community that makes Columbia a welcome melting pot. Just think -- a collection of local specialties, including entertainment, art, events, and interactive experiences, all against the backdrop of Main Street, the focal point of downtown Columbia. From the 1200 block down to the 1700 block, First Thursday-goers will enjoy a taste of retailers and galleries open late. A few of our monthly stops include Anastasia and Friends Gallery, Cantina 76, Columbia Museum of Art and Hampton Street Vineyard. There is also a complimentary shuttle (thanks to the City Center Partnership’s Yellow Shirts). Service runs free until 11 p.m., making it easy to hop around town. See the full list of local destinations here and mark the first Thursday of the month down on your calendar. We'll see you soon! It may be hard to believe, but summer vacation is right around the corner. With the temperatures rising, we are entering the time of year that is perfect for outdoor activities. One of the most popular and exciting attractions for families in all of Columbia is the Riverbanks Zoo and Gardens. It may be hard to believe, but summer vacation is right around the corner. With the temperatures rising, we are entering the time of year that is perfect for outdoor activities. One of the most popular and exciting attractions for families in all of Columbia is the Riverbanks Zoo and Gardens. The beautiful zoological center is less than 10 minutes away from Hotel Trundle. Of course, the zoo features animal favorites like lions, zebras, giraffes, tigers, sea lions, kangaroos, and bears, oh my! However, the animals are only part of the experience. At the Giraffe Overlook, you have the opportunity to hand feed the gentle giants. You can get up close and personal with Australia’s favorite marsupials in the Kangaroo Walkabout. Plus, there are pony rides, the Endangered Species Carousel, the Spots and Stripes Railroad, and even zip-lines for you and your family to enjoy. At the Riverbanks Zoo and Gardens, there are exciting adventures around every turn. What happens when you take the Western Auto building, Powell Furniture building and the Rose Talbert building, and fuse them all together? You get us, Hotel Trundle! We’re proud of our historic roots that date back all the way to 1914. What happens when you take the Western Auto building, Powell Furniture building and the Rose Talbert building, and fuse them all together? You get us, Hotel Trundle! We’re proud of our historic roots that date back all the way to 1914. Let’s take a little step back in time for a quick history lesson. Our main lobby entrance is in the former Western Auto space, which called the area home for 45 years. It was important to keep the integrity of the storefront, especially after we found it by removing an aluminum slipcover in 2016! If you feel like your walking into a 40’s era storefront when we welcome you, that’s why. Ok, taking it back almost a century, the Powell Furniture building is a nostalgic example of 20th century architecture in our town. The staple structure has seen the likes of Sears Roebuck, Jenkins Auto Parts, and the Knights of Columbus. Rounding out our trifecta of historic goodness is the Rose Talbert building, a true brick beauty. Much like her adopted sister, the Western Auto Building, the structure also experienced a cover up, which was removed to showcase the exterior’s trademark stucco. You’ll enjoy a number of modern amenities and works of art when you stay with us, but we always invite you to take a look back at Columbia’s rich history. No need to visit an art gallery or museum when you stay with us! We love infusing local art into our spaces and invite you to come and snap some of our favorite (and may we add) Instagram-worthy installations. No need to visit an art gallery or museum when you stay with us! We love infusing local art into our spaces and invite you to come and snap some of our favorite (and may we add) Instagram-worthy installations. Columbia is no stranger to incredible artists and we’ve worked with a number of creative geniuses to inspire our guests in ways that evoke positivity, creativity and depth. Not staying with us? That’s cool too, we’d be happy to show you around. Start with a custom blended roast by Indah Coffee and work your way through Lauren Dillon’s plaster sculpture installation just inside our lobby (you’ll be seeing her again). Next, take a journey through photography thanks to film captured by Ashley Concannon. We love a variety of artistic mediums and hand-woven textiles is just one of them. Check out Bonnie Younginer’s take on texture featured on our gallery wall. And, you can’t leave without a perfect selfie that stands for “Living Joyfully. Dreaming Fearlessly.” by Lauren Dillon. Need we say more? See the full line up of locally-commissioned artists and their works here.